Inquiry unit "Where does our food come from?" 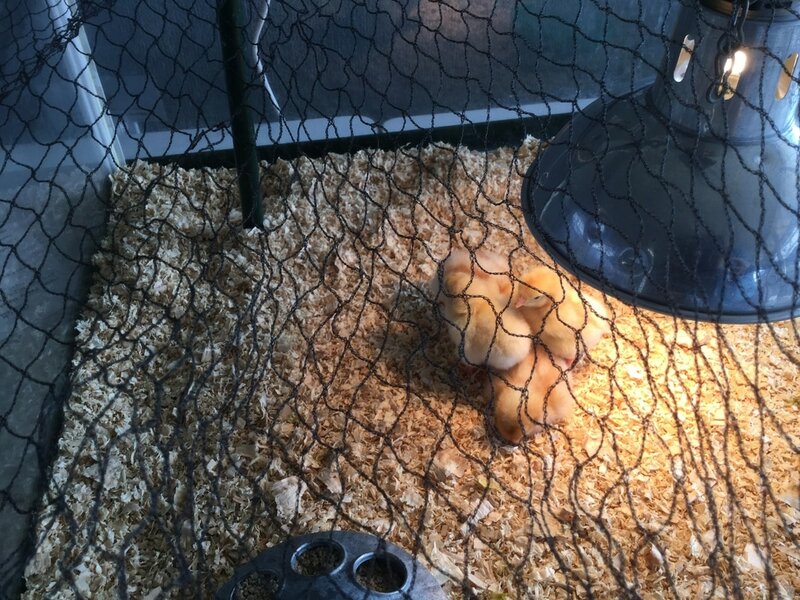 The Grade 1s and 2s are SUPER excited with the delivery of 12 eggs in an incubator and 4 freshly hatched chickens! 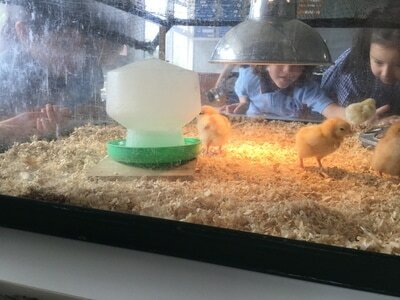 The children will be sharing the care of the little chicks, including feeding and cleaning the chicken coop. 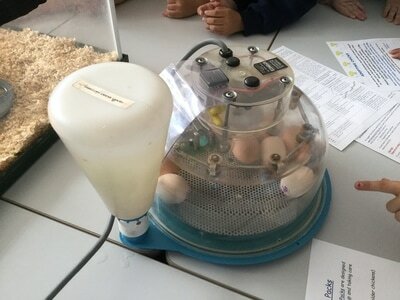 They have asked many questions already that we will be finding answers too, including how long does the chicken stay in the egg. We will have the chickens for two weeks. 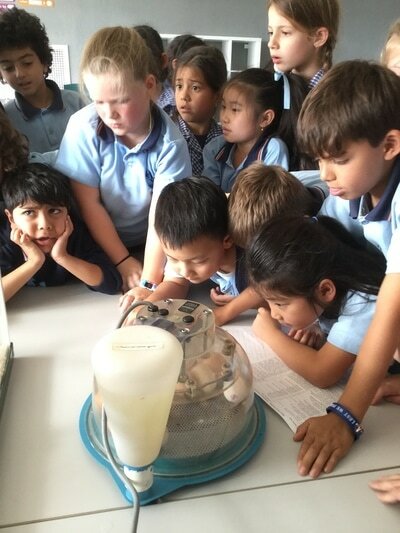 Grade 1 have been discovering many exciting things about water over the last 2 weeks! 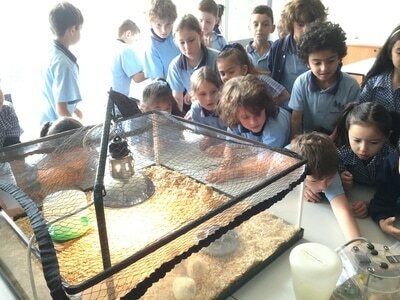 This week we conducted some experiments together. We predicted what might happen when we add drops of dye to our shaving cream clouds. We discovered that clouds RAIN when they are heavy! 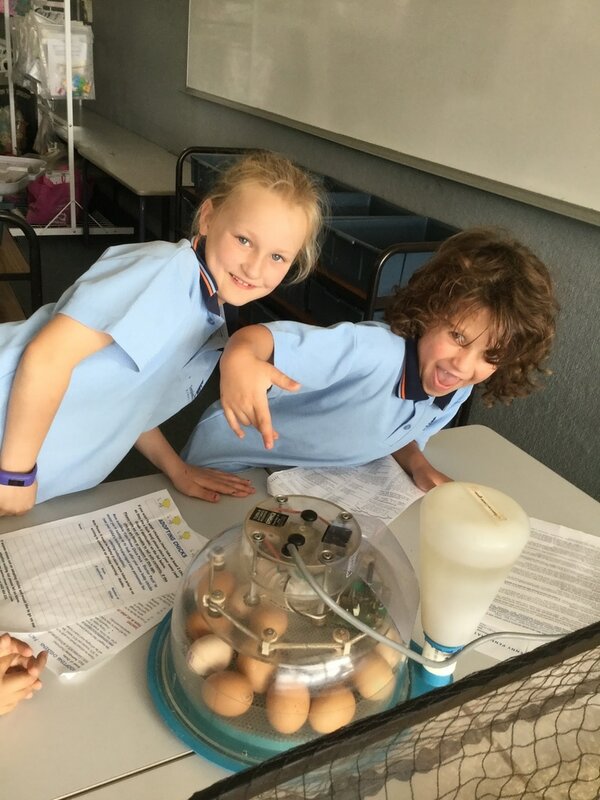 We also found out that what happens when water heats up. 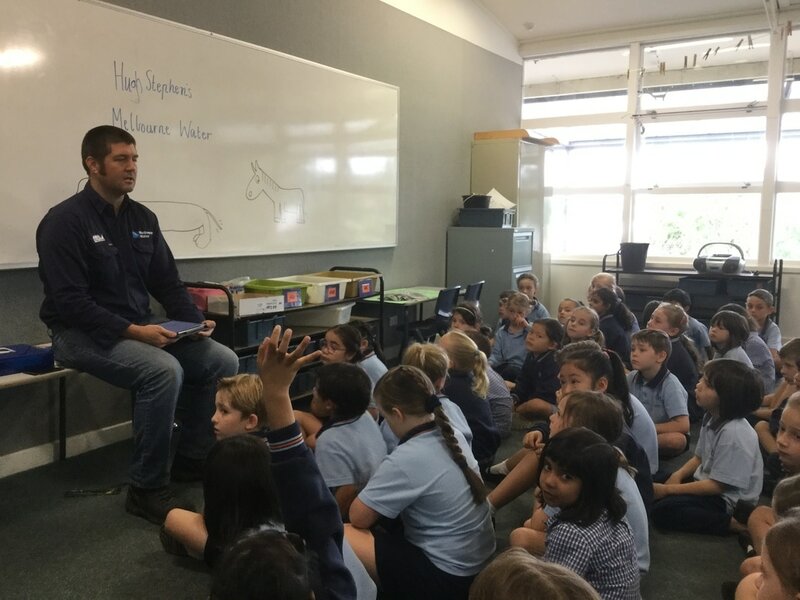 The Grade 1s and 2s were fortunate today to have a visit from Hugh Stephens from Melbourne Water. He spoke about how our water comes down from the mountains into our river ways. The children were fascinated to learn there is a huge drainage pipe under the school oval that takes water all the way to Kestrel Creek. through Westerfolds park and into the Yarra. Hugh answered many of our questions from our Water Inquiry, including "Why is the sea salty?" and "Where do puddles go?" Ask your child what were the answers. The Grade One's are having lots of fun at Aquarena, learning to perfect their swimming techniques and developing their water confidence. The teachers have been very impressed with how responsible they have all been, caring for their swimming things and travelling on the bus. Grade 1 had a (footy) ball on footy day! We made up our own teams, jersey and team chants with a partner, made favourite team graphs and went out for some footy ball games. A fun day was had by all for our Book Week celebrations. We shared a book with the Grade 4s in the hall and then enjoyed a parade on stage with the whole school. There were lots of Mr Men, Ninja Turtles and Dr Seuss characters and that was just the teachers! Grade 1s had a fabulous time at Camp last Friday. We enjoyed eating yummy pizza, lollies and icy-poles whilst watching the movie Turbo. It was such fun coming to school in our pyjamas and being with our friends. We can't wait until next year's camp in Grade 2!